Southsea Greenhouse is a very social enterprise - a collective of gardeners and crafters who want to make local shopping, growing, crafting, recycling, bartering and sharing of skills, a positive lifestyle. 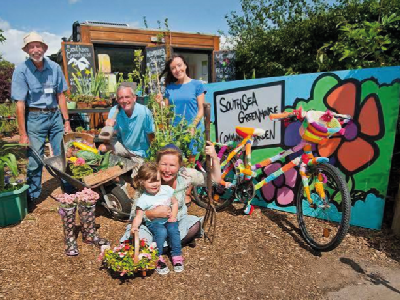 The Greenhouse Community Co-operative is transforming wasteland into a community garden and re-investing profits from sales of produce and crafts, back into the local community. We have created regular community events and workshops are offered free of charge, to encourage sharing of local skills and resources, foster a love of the city's greenspace, and care for its wildlife. Food provenance and healthy eating is a key principle. The Food Co-op, brings 100% organic produce into the city weekly (with no air miles), from a respected grower and distributor: Wayside Organics. The swap-shop scheme includes seeds, seedlings and surplus from allotments and gardens to reduce food waste and increase the supply of local grown produce on Portsea Island. Southsea Greenhouse co-manages the annual ‘Portsmouth in Bloom' competition, which encourages homes, businesses and schools to brighten the city with flowers and food, grown between April and July. Thousands of people from across the City participate in this celebration of colour, skills and creativity, which also enables those with little experience to learn from others. Our skillshops have used European funding to bring handicrafts and gardening skills to local people who are unemployed or disadvantaged, to improve their confidence and skills. Southsea Greenhouse aims to encourage local development and employment and the model is now being extended to other potential community grow-spaces: sharing land, planting trees, teaching others how to cultivate. There is growing membership of 200+ and it encourages a thriving network of painters, knitters, ceramicists and woodcrafters that taps into the amazing resources and talents across the city, and promotes local produce and crafts. We want to change the way people consume, celebrate the creativity of people, and improve what you get from our City.